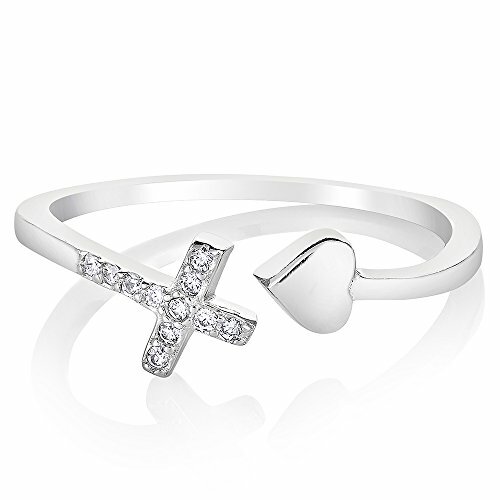 This beautiful Love of Jesus Cross Heart Ring would be a wonderful addition to any wardrobe. Made from 925 Sterling Silver, Cubic Zirconia CZ, stamped 925 Nickel free. The included jewelry gift box makes it a perfect gift for any special occasion. STAMPED 925 STERLING SILVER - This beautiful cross & heart ring is made from the finest sterling silver as hallmarked with the 925 metal stamp. 925 sterling silver is made from 92.5% silver and 7.5% copper. The copper is added to stabilize the silver so that it can hold its beautiful shape and inlaid with white cubic zirconia for a beautiful look. NICKEL AND LEAD FREE - This beautiful ring is designed with absolutely no nickel or lead, making it safe for girls and women with nickel and lead allergies. Add this fashion forward, simple and durable, every day piece to your loved one's jewelry collection and have peace of mind every time she wears it. BAND RING - The front of this ring size 8 x 6 mm, This cross & heart ring available in sizes 6, 7, 8 and 9. If you are looking for a jewelry accessory to take you from casual to formal without having to change, then look no further. This simple piece will accent your day to night style. A perfect piece of costume jewelry to accessorize your everyday style, business casual dress or more formal dress occasions. GREAT AS A GIFT - This beautiful cross & heart ring in a pretty gift box would be a perfect gift for that special someone in your life. Buy this ring for your wife, daughter, sister, or best friend, and know that without a doubt you have purchased the perfect present for the any occasion, whether it is for Mother's day, Valentines-day, Christmas, Graduation or their birthday.